Premium Blues Rock from this award-winning band's fourth album, recorded live and featuring blistering guitar and wailing harmonica for over 60 minutes of "House Party" favorites! This band is all about dirty licks and clean transitions. And like true professionals, their live album is just as tight as any tweaked and buffed studio recording. They don’t need overdubs or autotuning. They just need a stage and, in this case, it was in New Hartford on June 22. The lucky audience got to witness righteous blues rock served hot thanks to the collective talents of Mark Doyle (guitar, vocals), Pete McMahon (harp, vocals), Joel Kane (bass, vocals) and Frank DeFonda (drums). With ease, the four-piece takes listeners through a vigorous set of slow burners like “Need Your Love So Bad” and absolutely smoking romps like “Mark’s Boogie,” which features some of the best guitar work you’re going to hear anywhere. For those in doubt, first check the resumes of the players (Doyle has worked with artists like Bryan Adams and Meatloaf, and John Mayall has called McMahon one of the best harmonica players he’s ever heard) and then go in with a fresh head to get rocked clear off. Kane’s bass lines are as riveting as his vocals are passionate, and DeFonda is, as drummers can be, the glue of the entire operation as the group navigates through seamless transitions and styles. The live disc features tunes familiar and new, with some surprises thrown in, including a tune from Eric Burdon and the Animals that McMahon admits he didn’t know prior. “Kind of a cool, old-fashioned boogie kind of thing with some psychedelic lyrics,” he introduces as the band digs into “Closer to the Truth/Hardlife Boogie,” a tune McMahon’s flawless vocals were built for. Every song is a highlight in its own right, but “Train Kept A’ Rollin’” is as hard and driving as they come and “I Just Wanna Make Love to You” gives the set an extra kick at just the right moment. Doyle is a professional in every sense of the word, and it shows in more ways than one. Not only is his own talent proof, but the musicians he surrounds himself with turn his smoking riffs into a full-blown fire. 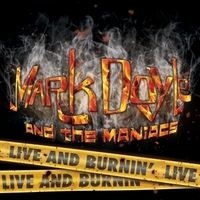 Formed in 2009, Mark Doyle & The Maniacs is the brainchild of guitarist/producer Mark Doyle. Signed to RCA in the early ‘70s with his first band, Jukin’ Bone (who played their own brand of fiery, Anglophilic blues rock), Mark has gone on to record and tour with artists as varied as Meat Loaf, Bryan Adams, Judy Collins, Leo Sayer, Kim Simmonds and Hall & Oates. A visit to the Discography page at Mark's website details the 70 albums that he has been involved in. With a stellar line-up that, along with Mark Doyle on guitar and vocals, now includes blues great Pete McMahon (The Kingsnakes, Savoy Brown) on harmonica and vocals, Frank DeFonda on drums and Joel Kane on bass and vocals, this outfit is downright armed and should be considered dangerous. Experience Mark Doyle and The Maniacs, Premium Blues Rock! Bring This One to the Party!